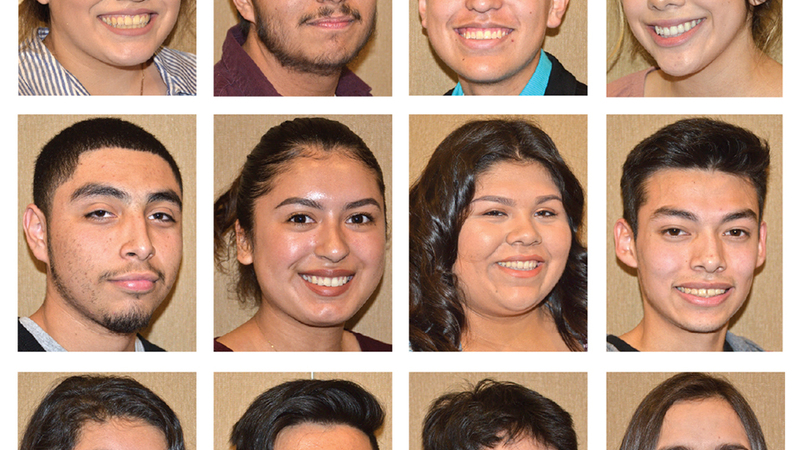 Anjelica Alvarez, Erasmo Arellano Leon, Anthony Julian Chavez, Bianca Lylea Sierra, Ernesto Lua Diaz, Crystal Llanos, Mersatee Aguilar Lopez, Jorge Luis Lopez, Maria Isabel Limon Rangel, Jose Pablo Barrera, Luis Acosta Vega, Julia Solis, Ramiro Garcia, Sissy Zendejas, Natalie Ito and Gloria Celestino Aguilera were among the first recipients of Latino Action Committee scholarships. Eighteen McNary High School seniors walked away from a banquet last week with an investment in their future. All the honorees earned $100 scholarships from the Latino Action Committee (LAC), a group founded by City Councilor Roland Herrera, Rev. Jose Dominguez and other Keizer Latino leaders. While $100 might seem like a small drop in the outsized bucket that is tuition cost for higher education, Dominguez pointed out that it was what the contribution represented that mattered as much as the dollar amount. When Dominguez graduated high school in the 1970s, he was presented a $75 scholarship. “What was important was someone telling me that I can and I will succeed,” he said. The group of honorees represented a diverse array of interests and pursuits, from becoming a stylist to biomedical engineering. Some will attend college in far-flung places like Indiana while others are heading just down the road to Chemeketa Community College, but Dominguez beamed with pride in every one of the students. “We were so encouraged by your applications and we were so proud of you. We want you to be change agents in your family, your community and your world,” he said. As they move into the next phases of their lives, he tasked the soon-to-be graduates with being role models, developing a spirit of community, not forgetting their roots and loving God and their neighbors. Aurora Cedillo, a board member of the Salem/Keizer Coalition for Equality, put special attention on small keys each of the honorees were given when they entered the room and lauded what they had already accomplished. In addition to the scholarships presented, one graduate, Julia Solis, was the first recipient of the LAC Community Service Award, which is sponsored by Herrera’s family. “She has been a leader in so many things, but I especially appreciate her work as part of the Kennedy Elementary School mentors for the past three years,” Herrera said. The scholarship honorees were: Gloria Celestino Aguilera, Western Oregon University (WOU), veterinary tech; Anjelica Alvarez, cosmetology; Jose Pablo Barrera, Chemeketa Community College, sociology; Gloria Celestino; Anthony Julian Chavez, Chemeketa/Colorado State University, sports medicine; Ernesto Lua Diaz, Chemeketa, computer science; Ramiro Garcia, Chemeketa/University of Oregon (UO), business management; Natalie Ito, Portland State University, pre-med; Erasmo Arellano Leon, Chemeketa, graphic design; Crystal G. Llanos, Stanford University, biomedical engineering; Mersatee Aguilar Lopez, Linfield College, nursing; Jorge Luis Lopez, Chemeketa, computer science; Maria Isabel Limon Rangel, community college, undecided; Jorge Bedolla Rodriguez; Iris Rodriguez; Bianca Lylea Sierra, UO, family human resources; Julia Solis, Ivy Tech Community College (Indiana), general studies; Luis Acosta Vega, WOU, education; Sissy Zendejas, UO, biology.